EHNAC is well-regarded and highly-valued in the health IT marketplace, both for its subject matter knowledge and its expertise in areas such as privacy, security, breach handling and IT security frameworks and standards, as well as ensuring compliance with federal regulations regarding HIPAA, ARRA/HITECH, NIST and others. 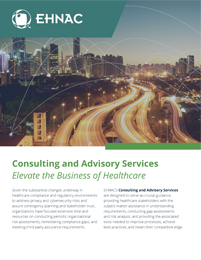 As such, EHNAC is now offering Consulting and Advisory Services designed to serve as a crucial guidance, providing healthcare stakeholders with the subject matter assistance in understanding requirements, conducting gap assessments and risk analysis, and providing the associated tools needed to improve processes, achieve best practices, and retain their competitive edge. Given the substantive changes underway in healthcare compliance and regulatory environments to address privacy and cybersecurity risks and assure contingency planning and stakeholder trust, organizations have focused extensive time and resources on conducting periodic organizational risk assessments, remediating compliance gaps, and meeting third-party assurance requirements. EHNAC’s senior staff including site reviewers and practitioners each have over 25+ years of healthcare experience, impeccable reputations in the industry, and comprehensive knowledge of the compliance issues their clients face. Through EHNAC’s Consulting and Advisory Services, these experts will assist EHNAC-accredited and EHNAC-candidate organizations prepare to achieve industry compliance certification, readiness assessments, HITRUST certifications, SOC audits and EHNAC accreditations so that they meet all essential requirements for privacy, security, cybersecurity, health information exchange, and more. Find out more about which is right for your organization by contacting us at info@ehnac.org or calling 860-408-1620.